you hear about something that you thought would never happen. i've been told i do that! this quilt...this really cute quilt with a GIANT outside border. 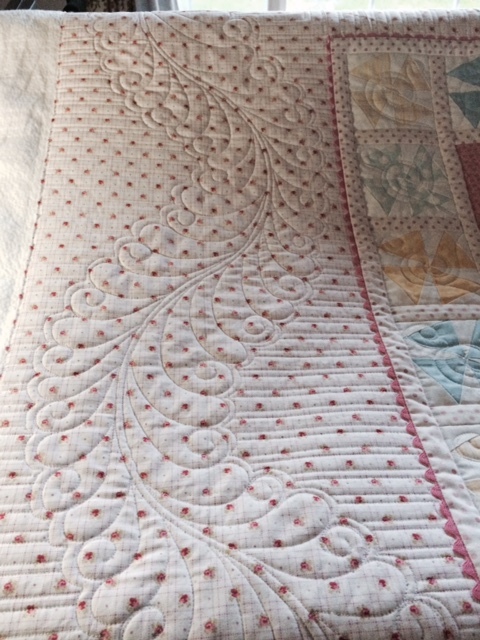 my sweet friend Kathi sent it to me spring of 2014.
and it hung in my quilting closet for a year because i just wasn't sure what to quilt. and boy did it speak loudly! i did these double spined feathers with bead board background. lots of stitch in the ditch. each of the doll dresses was quilted differently. (is it okay to confess that it wasn't very even??) and i loved how it turned out. curved cross hatching, bead board work in border, and other curves. the rest of the work is freehand. feathers, ribbon candy, and the fill on the dresses. it was on the frame for about two weeks and i worked pretty steadily on it. in Graham County Fair in Safford, Arizona. here's a close up of the ribbons. so much in my life has come together in the last couple of years and this is the icing on the cake. the cherry on the sundae. well...okay...there are a few other things that would be better but i won't share those now. "will you quilt something like this for me?" seriously. send me an email. 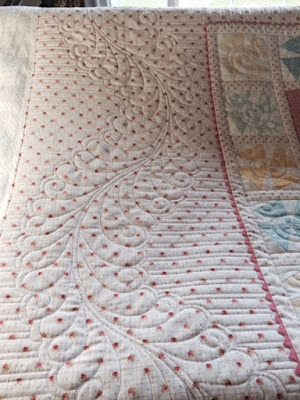 this kind of quilting takes a lot of time and creative energy. obviously, i have it in me but i've learned that when i feel pressure (oh the pressure of a ribbon win!) it just is elusive. i really need to wait and wait patiently for the quilt to talk to me. sometimes it happens quickly and sometimes it doesn't. sometimes it takes a year. what a treasure it sure is, that waiting time. that's the moment when magic happens.